Amity University Madhya Pradesh organized a five day Inspire Internship Programme from 16-20 January, 2017. This novel programme was launched by former Prime Minister Dr. Manmohan Singh on December 13, 2008. INSPIRE programme provides platform to the young minds to innovate new ideas to enhance environment sustainability, make it healthier to live in and also to interact with the renowned scientists (Padma Shri awardees and Bhatnagar Awardees) and academicians from different fields of Science & Technology from all over India. The aim of the programme was to encourage the brilliant young minds to the study of basic sciences and technology at an early stage and select R&D as a career. The programme was sponsored by the Department of Science and Technology (DST) Govt. of India, New Delhi. Approximately 200 students from 15 different schools of Gwalior division participated in the events. The science teachers from various schools also participated in this INSPIRE Science Programme. The programme started with the registrations of participants. The Inaugural session started with an auspicious lamp lighting by Chief Guest and Shanti Swarup Bhatnagar Awardee Prof. G. P. S. Raghav, Chief Scientist & Head, Bioinformatics Centre, IMTECH, Chandigarh, Hon’ble Vice Chancellor Lt Gen VK Sharma, AVSM (Retd. ), Pro-Vice Chancellor Prof. (Dr.) M. P. Kaushik, Coordinator of the event and Director ASET Prof. (Dr.) Anil Vashisht, Dean Research Prof. (Dr.) S. P. Bajpai, Dean Academics Prof. (Dr.) R. S. Tomar, Registrar Shri Rajesh Jain, Deans, HOIs, HODs, faculty members of Amity University, Gwalior and participants which was followed by Saraswati Vandana and felicitation of Guests. The welcome address and introduction to programme was given, by Prof. (Dr.) S. P. Bajpai, Dean Research, Amity University, Gwalior. In his address he informed the audience about the Bhatnagar award and introduced the audience to the INSPIRE programme. 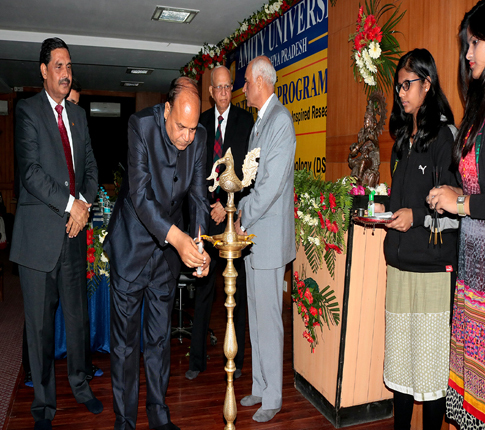 Thereafter, Hon'ble Vice Chancellor, AUMP and Chair Person of the programme, Lt Gen VK Sharma, AVSM (Retd.) delivered the opening remarks and enlightened the participants with the importance of INSPIRE. He also stressed that the strength of the innovation infrastructure of a nation has enormous significance in the competition among emerging knowledge economies. Prof. (Dr.) G. P. S. Raghav, Chief Scientist and Head, Bioinformatics Centre, IMTECH, Chandigarh was the Chief Guest and Key Note speaker of the programme. He delivered the Keynote address on “Computer-aided Genome-based Medicine”. Prof. Raghav encouraged and motivated students to do what they love and enjoy a better living. He viewed that wonders can be achieved only by combining talent, technical skills, and logical minds through proper human interfaces. Post tea session, Prof. Vivek Polshettiwar, Principal Investigator, Nanocatalysis laboratories, TIFR, Mumbai, delivered a talk on “Climate Change and Nanotechnology”. In his lecture he stressed that Global warming is the most serious problem mankind has ever faced. Carbon dioxide (CO2) emissions need to be urgently reduced to avoid potentially dangerous climate change, which may not be reversible. Life -the most complex form of matter in the universe – is on course for its inevitable extinction, unless we humans, the chosen ones, can agree to live within the limits of these rules. Post lunch session was taken by Prof. Avinash Kumar Agrawal, Professor, Department of Mechanical Engineering, IIT Kanpur. He gave his talk on “Global Transportation Systems and Fuels: Past, Present and Future”. In his talk he explained that the transportation is the movement of people, animals and goods from one location to another. Transport enables trade between people, which is essential for the development of any civilization. Furthermore, he discussed about the Bio fuels which are emerging as strong renewable alternative to as energy security, environmental issues and air quality improvement. Biodiesel produced from plant material attracted a lot of attention as it requires fewer modifications in the engine and is an environmental friendly fuel. Hydrogen is a zero-emission fuel, when it is used for combustion in internal combustion engines or to propel fuel cell vehicles. However, hydrogen fuel suffering with higher production cost and storage difficulty. The last session of day one was conducted by Prof. (Ar.) Rishi Raj Kapoor, Department of Architecture, Amity University Madhya Pradesh, Gwalior on “Igniting the Minds for Innovative Ideas.” He emphasised on how a young mind is the sharpest mind. It learns quickly and acts quicker. The education system of today focuses on books and rote-learning, but time is changing as these young geniuses, who choose to take a different path, have proved. They have picked machines over books and ideas over words. These young minds are the future of India. To replace the traditional way of thinking and visualizing the solutions in more scientific and innovative way, a spark is needed to these budding minds. Day one of this programme ended with the briefing of the next day activities. The second day of the INSPIRE Internship Programme started with the attendance of all participants at the registration desk followed by the welcome and felicitation of the Mentor Prof. (Dr.) Ramesh Ramapaniker, Assistant Professor, IIT, Kanpur. He delivered a talk on “Chemicals in Daily Life: Synthetic Natural”. He stressed on the increasing concerns over pollution and health hazards that are resulting from excessive use of chemicals in all facets of life. The term ‘chemicals’ has become a word of caution for the common man. It is important to realize that everything around us is made of chemicals either in a pure form or as mixtures of different chemicals. A general understanding of chemicals and the ability to distinguish between essential and avoidable chemicals are important for a science student. An introduction to chemical research can best be begun with an understanding of what is to be synthesized. In this talk, he also discussed about the various chemicals that we are exposed to in our daily life, their properties and how easily can they be replaced with less harmful chemicals. Post tea session was dedicated to motivate the participants for writing their Innovative Ideas in the field of Science and Technology. For this a ‘Innovative Idea Contest’ were organized for participants. In this contest, student of K. V. No.1, Gwalior Master Aditya Shakya, Student of RKVM, Gwalior Master Aditya Sharma, and student of K. V. No.1, Gwalior Master Prashant Bist won the first, second, and third prize respectively. Furthermore three students of K. V. No.4, Gwalior Ms. Vaisnavi Chauhan, Student of Miss Hill Hr. Sec. School, Gwalior Master Ansuman Singh, and student of K. V. No.1, Gwalior Master Vishwajeet Gupta won the consolation prize. After the lunch break, the next mentor of the session was Prof. (Dr) M. S. Marwaha, Department of Physics, Punjab University, Chandigarh. He addressed the participants on the topic “Misconcepts about the Optical Phenomenon of Mirage, Rainbow Formation”. In his address he explained the two phenomenon by refraction of light and not by Total Internal Reflection as is written in the literature. He stressed the misconcept, when a burning candle in a container having water is covered by beaker or glass, the water rises. The rise of liquid/water is not due to consumption of oxygen but heating of surrounding air. These concepts were explained and demonstrated experimentally in his second lecture. During this he successfully gave experimental demonstration on various concepts on Wave Motion, Interference, Diffraction, Polarization of light, Electromagnetic induction, Mechanics. Day two of this programme ended with the briefing of the next day activities. The third day of the INSPIRE Internship Programme started with the attendance of all participants at the registration desk followed by the welcome and felicitation of the Mentor Dr. Suvendra Nath Bhattacharya, Principal Scientist and Head, Molecular Genetics Division, CSIR-Indian Institute of Chemical Biology, Kolkata. He delivered a talk on “Modern Biology: A Journey Towards Molecular Understanding of Life”. In his talk, Dr Suvendra Bhattacharyya introduced the logic of biology that governs the creation of life on earth. Furthermore, he explained how the bio-molecules are formed and also discussed the interdisciplinary aspect of modern biology. At the end he discussed about the major challenges that the modern biology is facing to solve the present problems. Post tea session was mentored by Dr. Deepak Chopra, Associate Professor & Dean Students Affairs, Department of Chemistry, Indian Institute of Science Education and Research, Bhopal, on the topic “Understanding the Role of Crystallography in Applied Sciences”. In his talk he explained that the science of determining the arrangement of atoms in crystalline solids is termed as Crystallography. This information is extremely useful in all the areas of sciences and is applied for the development of new materials and the associated properties. The knowledge extracted from this Science is used by Chemists. Physicists, Biologists, Metallurgists, Geochemists and the Engineering community as well. This science has produced 28 Nobel Prizes, the highest in any scientific field. His talk was a journey through this exciting, vast and extremely fascinating area of research and illuminated the audience with the most important achievements in this area and the contribution towards the development of mankind and society as a whole. The third mentor of the day was Prof. (Dr.) R. K. Sharma, Department of Mathematics, IIT Delhi. 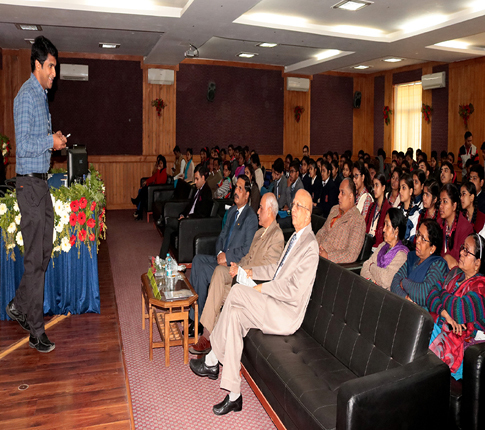 He delivered a talk on “Gold Mine”, while motivating the participants to take up careers in science and research. In his talk he discussed about the magical prime number to the participants. Dr. Sharma explained with the help of examples about the Mersenne prime number and displayed the largest prime number to till date which is 274207281 and is comes about a number with 22338618 digits. He also discussed about the quadratic equation. Furthermore, He talked about the various steps to make mathematics much interesting. Later he asked several important questions related to algebra and rectify the doubt and misconception of the participants. After the briefing of next day activities, all the participants were moved to field visit to DRDE, Gwalior, wherein the participants visited various high-tech research labs, such as Synthetic Chemistry Lab, Vector Management Division, Microbiology Division, Discovery Centre, Viriology Lab and so on. The students were overwhelmed with the practical exposure and were bubbling with energy while interacting with the eminent scientists of DRDE throughout the visit. The Fourth day of INSPIRE Internship Programme started with the attendance of all participants at the registration desk followed by the group photograph of participants. Thereafter, the written science screening “Quiz Competition” for the bright interns. The Quiz Competition was conducted under the active supervision of Dr. Vinod Bhatt, Associate Professor, Amity School of Languages, Amity University, Madhya Pradesh and his team to shortlist the top eight participants for oral quiz session scheduled for the next day. The following students qualified for the second and final round of Quiz competition. Master Vachaspati Sharma, PVP, Gwalior, Master Anurag Gupta, Miss Hill Hr. Sec. School, Gwalior, Master Prashant Shukla, K. V. No. 1, Gwalior, Master Shri Kant Singh Gurjar, Miss Hill Hr. Sec. School, Gwalior, Master Vishwajeet Gupta, K. V. No. 1, Gwalior, Master Mayank Srivastva, K. V. No. 1, Gwalior,Ms. Shruti Pandey, No.1 Airforce, Gwalior, Ms. Anuradha Mahato, No.1 Airforce, Gwalior. The next session was mentored by Dr. Vijay Tak, VERTOX, Defence Research & Development Establishment, DRDE, Gwalior on “From Small Molecules to Big Ideas”. According to the famous Central Dogma of life, information flows from DNA to RNA and RNA to proteins. However, life would not be possible with these macromolecules alone. For Central Dogma to be fully descriptive about the life, small molecules (metabolites) should be taken into account. These small molecules have very critical role at all the levels of biological systems. By exploring a comprehensive picture of metabolites in any biological systems, metabolomics provides answer of many clinical and research questions. The Post lunch session was taken by Dr. G S Sodhi, Associate Professor, Department of Chemistry & Forensic Science, SGTB Khalsa College, Delhi University, who delivered a talk titled “Scientific Method of Mitigating Crime”, He presented the various perspectives of finger print development techniques, which can detect even the faintest finger prints clear and sharp. His talk was followed by the most exciting hands-on sessions on “Forensic Science”. The next session was dedicated to the demonstration, experiments & hands on, in the various laboratories (like Applied Chemistry, Civil Engineering, Applied Physics, Electrical Science and Biotechnology etc.) of Amity University, Madhya Pradesh, Gwalior. Day four of this programme ended with the briefing of the next day activities. The Fifth day of INSPIRE Internship Programme started with the attendance of all participants at the registration desk followed by the final round of Quiz Competition. The Quiz test was conducted under the active supervision of Dr. Vinod Bhatt, Associate Professor, Amity School of Languages, Amity University, Madhya Pradesh, Gwalior. In this session top eight students from the previous round of competition enthusiastically participated. They formed 04 teams of 02 members each through a draw of lots. The selected four teams participated in the oral quiz. In this quiz, Master Vachaspati Sharma, PVP, Gwalior and Master Anurag Gupta, Miss Hill Hr. Sec. School, Gwalior won the first prize, Master Prashant Shukla, K. V. No. 1, Gwalior and Master Shri Kant Singh Gurjar, Miss Hill Hr. Sec. School, Gwalior won the second prize, Master Vishwajeet Gupta, K. V. No. 1, Gwalior and Master Mayank Srivastva, K. V. No. 1, Gwalior won the third prize, and Ms. Shruti Pandey, No.1 Airforce, Gwalior and Ms. Anuradha Mahato, No.1 Airforce, Gwalior won the fourth prize. Post tea session was mentored by eminent Professor and Padma Shri awardee Prof. (Dr.) K. L. Chopra, Founder Coordinator and Advisor Thin Film Laboratory, IIT Delhi. He gave a talk on “Atoms to Nanomatters”. He started the session by tickling young minds with some interesting questions on Physics. Then he proceeded the session by defining the Nanomatter and its creation by Physical Vapour Deposition Techniques (PVD), Plasma Synthesis Techniques (Sputtering & PECVD), Chemical Vapour Deposition Techniques (CVD), Chemical Bath Deposition Techniques (CBD). Further, in his talk he mentioned the uses of Nanotechnology in Biomedical Science, Chemistry and Metallurgy and also emphasized on how Nanotechnology technique helps in developing of Solar cells. He concluded the session with a saying “Small is beautiful, small is bountiful”. During his lecture he asked several questions to the students and further resolved their queries about the Nanotechnology and Thin Film Technology. Post lunch session was mentored by Prof. P. K. Joshi, Department of Environmental Science, Jawaharlal Nehru University, New Delhi on “Geoinformatics for Environmental Management”. In this lecture he explained Geoinformatics which is the domain of science and the technology that develops and uses Information Science Infrastructure, Information and Communication Technology (ICT) and others) to address the problems related to our immediate environment. The key component with this science is location passed information and solution which is truly interdisciplinary. The lecture introduced the students to basics and essential components of Satellite Remote Sensing, GIS, GNSS/GPS while touching upon the developments done in the country. With the examples from different sub-sectors of environmental sciences, like forests, human settlements, agriculture, industrialization, climate change and human interaction, the lecture deliberated on the applications of Geoinformatics. The next session was conducted by Mr. Richard Philip, Dy. 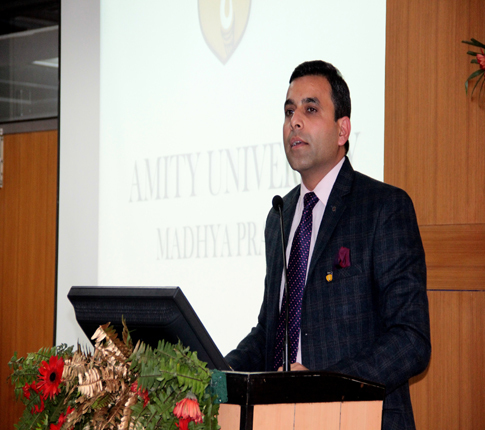 Director Admission, Amity University, Gwalior on “Career Counselling”. 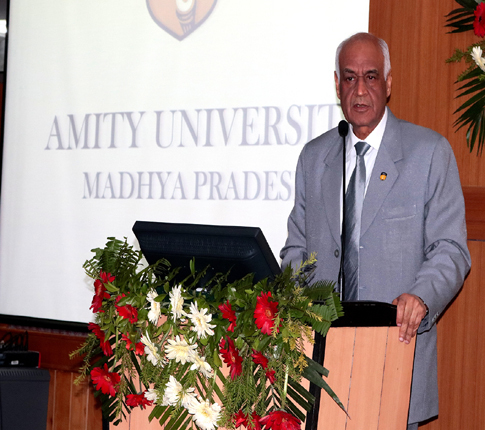 In his address he guided/ counselled the participants about the planning/ shapes their career in the various fields, higher education opportunities and their eligibility/ activity calendar of higher education and opportunities in Amity University, Madhya Pradesh, Gwalior. The five day programme ended with the Valedictory Ceremony which began with the welcome of Chief guest Padma Shri, Prof. (Dr.) K. L. Chopra by Hon’ble Vice Chancellor, AUMP Lt. Gen. V. K. Sharma, AVSM (Retd.) along with Pro-Vice Chancellor Prof. (Dr.) M. P. Kaushik, Coordinator of event and Director ASET Prof. (Dr.) Anil Vashisht, Dean Research Prof. (Dr.) S. P. Bajpai, Dean Academics Prof. (Dr.) R. S. Tomar, Registrar Shri Rajesh Jain, Deans, HOIs, HODs, faculty members of AUMP, Gwalior and participants. In his valedictory address, Esteemed Chief Guest Padma Shri Prof. (Dr.) Chopra talked about “Science and Technology in India: Future Prospects”. In his valuable talk he stressed that we must produce knowledge that is translatable into productivity by innovations that becomes our nation wealth which creates the job opportunities for youths. He informed that the current learning is outcome based and how to use technology for society. He opined that there are plenty of opportunities in every field like energy, food, medical, agriculture, water and society, but it is up to the students to grab the opportunities by applying innovation and research. In his concluding remarks, the Hon’ble Vice Chancellor, Amity University, Madhya Pradesh Lt. Gen. V.K. 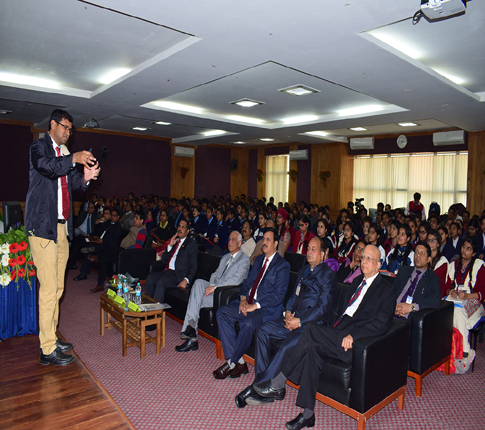 Sharma asked the students to understand the fundamental concepts of science, so that the accepted theories can be challenged by future researchers. During these five days they got a chance to interact with the eminent speakers from various fields of Science and Technology. Out of which three speakers were Bhatnagar and Padma Shri awardees and the rest from reputed institutions / Universities or eminent researchers. He gave certain topics for future research to the participants like Internet on Things (IOT), Humanoid Internet, 3D Printing, Solar energy, Water Solution, Patent for bacteria and Biotechnology and Bioinformatics. He strongly advised the students to work very hard to innovate and to take up new challenges in the field of science research and development. The aim of this event was to trigger/ ignite the students to do innovation in order to resolve following problems/ challenges of our nation like for good health, for better education, fresh water, quality food, fresh air. Thereafter, the winners of the Innovative Contest, Quiz Competition, active participation and volunteer of AUMP were given certificate and prizes by the Hon’ble Chief Guest Padma Shri, Prof. (Dr.) K. L. Chopra along with the Hon’ble Vice Chancellor Lt Gen VK Sharma, AVSM (Retd) and Coordinator of the event and Director ASET Prof. (Dr.) Anil Vashisht. There were six prizes for Innovation Contest including three consolation prizes, four prizes for Quiz Competition. One active participant from each school was also awarded. The vote of thanks was proposed by the Coordinator of the Programme Prof. (Dr.) Anil Vashisht, Director, Amity School of Engineering and Technology, Amity University, Gwalior. In his vote of thanks he thanked on behalf of Amity School of Engineering and Technology and the entire university to global icons of science and distinguished guests of the day Padam Shri, Prof (Dr) K. L. Chopra, Founder Coordinator and presently advisor Thin Film Laboratory, IIT Delhi, Prof. P. K. Joshi, Department of Environmental Science, Jawaharlal Nehru University, New Delhi, Hon’ble Vice Chancellor Amity University Madhya Pradesh, Gwalior- Lt. Gen. V.K. Sharma, AVSM (Retd. ); Pro Vice Chancellor, Prof Dr M. P. Kaushik; Dean Research Prof Bajpai; Registrar, Deans, HoIs, HoDs, faculty members and the supporting staff of AUMP, Administration Department headed by Col. S. K. Sethi (Director Administration), Mr Umesh Kant Sharma & their Support Staff, Dr Sumit Narula, Director, ASCO and his team, students and the teachers who have attended this internship programme, Organizing secretary Mr. Alok Jain, to all team members including, last but not the least Members from print and electronic media.